A brand-new site, and my first post is on something brand-new to me: a cookbook review! I often say the Gourmez isn’t a recipe blog—except for cocktails, because who doesn’t enjoy a good cocktail discovery? But when I was offered a review copy (obligatory disclaimer: that means free!) of Heather Pace’s Sweetly Raw Desserts, I decided to say yes for one main reason. My husband has cut down on his carb intake the last several months, and I wanted to support his efforts by coming up with desserts that don’t rely on flour. Checking out a cookbook full of raw desserts seemed liked a great way to experiment with that. Why? Because the raw diet is one that believes foods are at their healthiest when they are uncooked, and usually when they aren’t heated at all. As a result, the raw diet is typically vegan, often gluten-free, dairy-free, and egg-free and stays away from refined grains, sugars, and vegetable oils. Indeed, all of Ms. Pace’s recipes fit that bill. But I’m warning you now—my takes on her recipes do not. Why? Because I’m not planning a conversion to a raw diet; I’m just looking for healthier options for dessert. I was not financially willing to replace items I already had that would do a perfectly good job when substituted for the preferred raw ingredients. 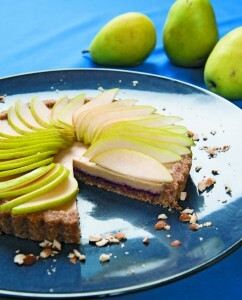 But I did pick up a few things from the cookbook’s extensive raw desserts pantry list in the first few pages of the book. Namely, coconut oil, dates, and agave syrup. I had most of the rest of the ingredients, or adequate substitutes, on hand already for the two recipes I tried. The cookbook’s photograph comes first and mine is second for comparison’s sake. As you can see, mine turned out pretty well! As for substitutions, I used refined sugar and unsalted dairy butter rather than the coconut versions of both. 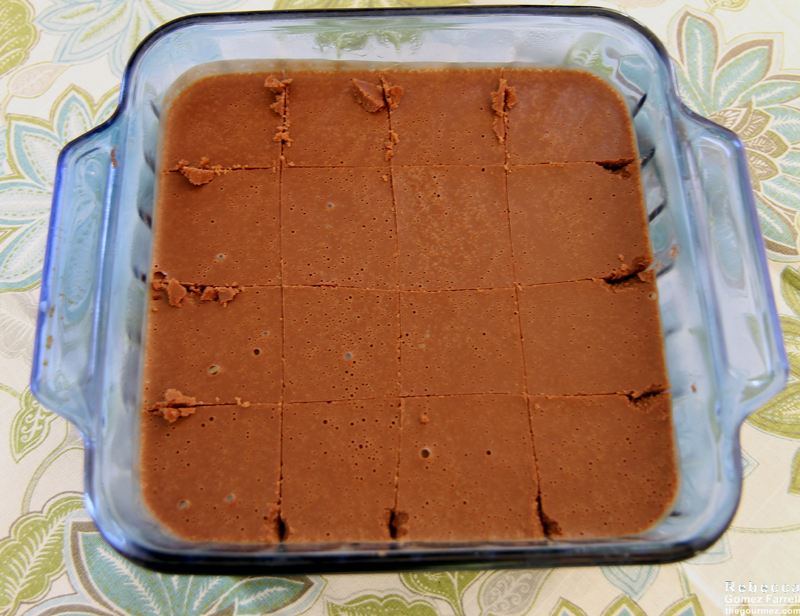 I also used unsweetened cocoa powder rather than cacao powder. To make the brownies Grind the almonds into flour in a food processor. Add the dates and raisins. Grind until they are completely broken down. Add the remaining ingredients and grind until everything is evenly combined. Press the dough into an 8-inch (20 cm) square pan. To make the frosting Blend all but the cacao powder until smooth in a blender. Add the powder and blend again. Spread the frosting over the brownies and chill in the fridge until the frosting is firm, 4 to 6 hours. Slice into 2-inch (5 cm) pieces. To make the pecans Toss all the ingredients together in a bowl. 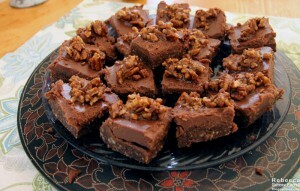 Spoon some of the pecans over each brownie before serving. The recipe was super easy to make as long as you have a food processer and a blender. They tasted fantastic, though I scoff at claims that coconut oil should be used because it has a neutral flavor—coconut oil should be used because it tastes of coconut! Yum! Also because it solidifies at room temp, making the texture of the frosting possible. 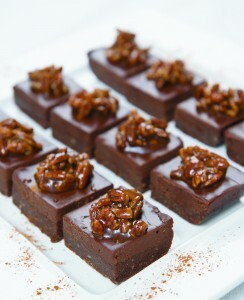 I enjoyed the textural combination of a firmer and softer layer, and each bar was very moist. They were also easier to remove from the pan than expected. From that to the platter wasn’t messy at all! My only critique is that I wouldn’t call these treats brownies. They are bars: delicious chocolate, date, almond, pecan, ginger, and cinnamon bars. Would—no will—make again. And now for the second recipe. I should note that I chose these recipes based on how easy they seemed—I am not ready to start making my own nut milks or willing to buy a bunch of chocolate molds. But Sweetly Raw Desserts does devote opening pages to making milks and other vegan dessert basics, and there are plenty of different types of recipes within from mulberry-coconut cake pops to chocolate-covered strawberry-chai ice cream bars. Again, the cookbook’s image is first and mine is second. 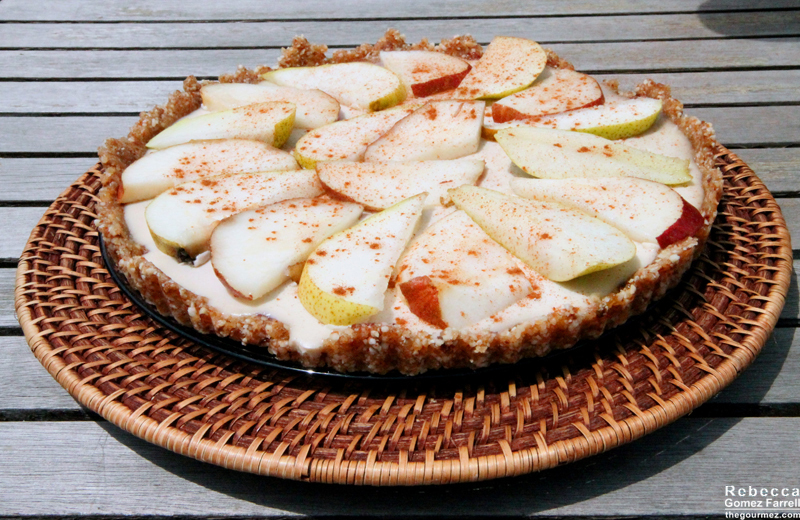 You’ll see that I added a dusting of cinnamon to my tart, wanting to liven up the coloring a bit and to hide how much worse my pear-slicing skills are than Ms. Pace’s. Other substitutions included again using unsalted dairy butter instead of the coconut alternative and leaving out the stevia drops as I doubted it would need the extra sweetness and I didn’t want to add another item to my pantry. I used a red Asian pear and a basc pear for skin color variation. I also upped the ingredient amounts a tad as I was working with a 10-inch, rather than 8-inch, tart pan. Yes, I can only be as specific as a tad, proof I am not qualified to be a recipe blogger! To make the crust Grind the almonds, coconut, and dried pear in a food processor. Add the dates and water. Grind until the dates are incorporated. Press the dough into an 8-inch (20 cm) tart pan with a removable bottom. Spread the jam over the tart crust. Chill in the freezer while making the filling. 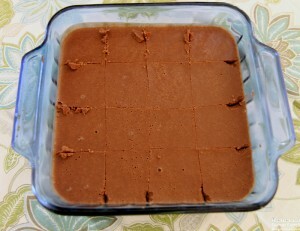 To make the filling Blend the cashews, water, nectar, and extracts in a blender until smooth and creamy. Add the butter, oil, and stevia. Blend again to incorporate. Pour the filling over the jam. Chill in the freezer for 4 to 6 hours and then in the fridge for 8 to 12 hours. Pop the whole tart out of the pan. 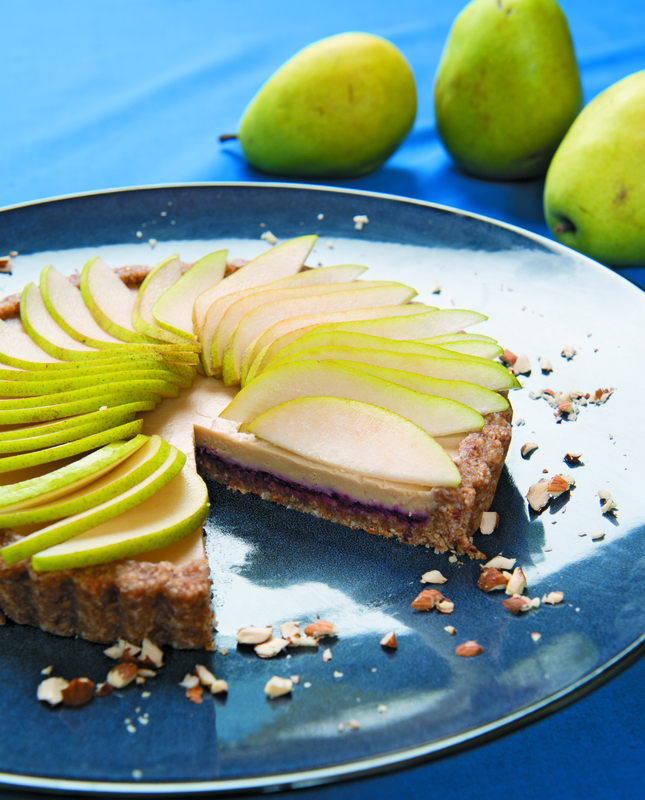 To assemble Once the filling is firm, arrange the pear slices on the top of the tart. Slice and serve. Other than wondering why cashew was left out of this recipe’s title, being as it plays a significant role in providing the cream, I was again impressed with the final product. 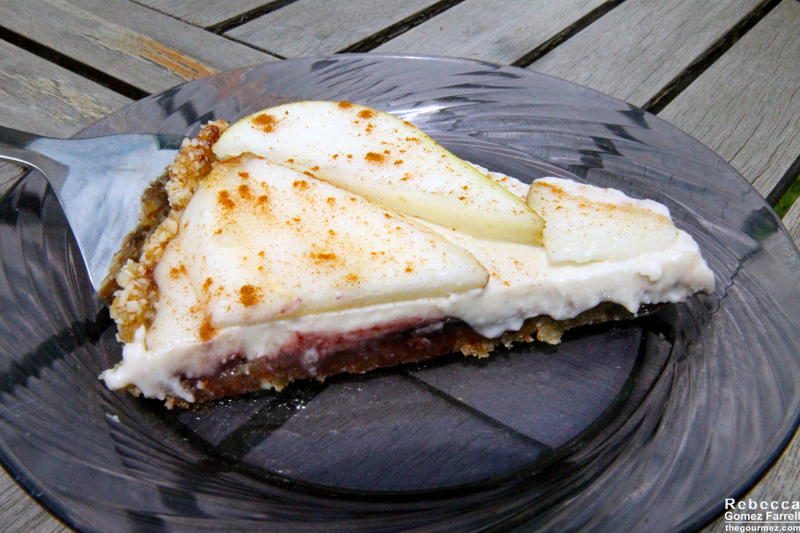 With the boost of almond extract and that delightful cashew, the cream element tasted fantastic. The crust held up well and was satisfyingly grainy. The thin layer of jam hit everything up a notch by contributing another layer of flavor. A better picture of the jam layer from my tart. The cream could be firmer, which may just mean leaving it in the fridge for less time than suggested before consuming it. I moved it back to the freezer to experiment, and I wouldn’t recommend that method. Just eat faster! That’s not so hard to do, I promise. 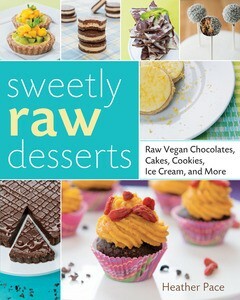 Hooray, Sweetly Raw Desserts! I have a whole new world of dessert possibilities opened up to me. And my husband enjoyed both those recipes immensely as well. If you’re interested in trying this cookbook out for yourself, just click on the Amazon links below to make a purchase. I seriously can’t believe these desserts were raw. The photos are just incredible and I definitely want to try them! The brownies are making me drool right now. Give them a try sometime! 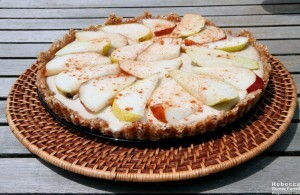 Pretty easy to make, which is a plus of the raw diet!